A group of mentors and fellows began day five in media interviews, appearing on African Young Voices Television and Radio Democracy to share their TechWomen experiences. On the radio, mentor Tina Shakour and 2015 fellow Jamillatu Kamara spoke about TechWomen, outlining its importance in amplifying diverse voices of women in STEM fields. At African Young Voices Television, 2018 fellow Sebay Momoh and mentor Katie Penn spoke about cultural diversity and the need for specialized programs that increase the prospects for women and girls’ futures. 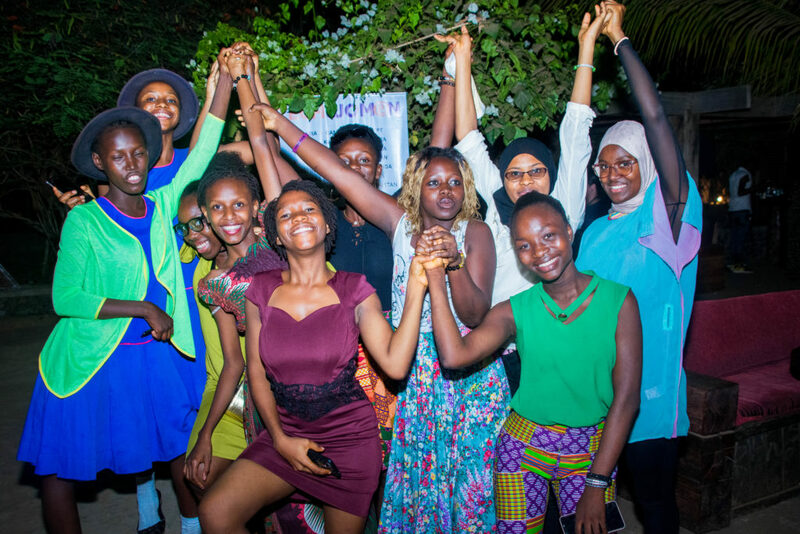 Sebay also had the opportunity to highlight the Sierra Leonean fellows’ community impact, connecting their initiatives’ missions and goals with the objectives of the TechWomen program. The afternoon was spent at the Women in #Techpreneurship event, a session that brought together experienced entrepreneurs and women in the local technology landscape. Trina Bolton of the U.S. Department of State set the tone for the afternoon, communicating the State Department’s support of grassroots initiatives that create more engaged, global citizens: “We believe that when women can fully contribute, it’s a better place for everyone,” she said. The afternoon’s first panel featured 2016 fellow Salwa Campbell in addition to local academics, business owners and entrepreneurs. Together, they spoke about how to best develop technology in Sierra Leone, discussing ways to engage young people and empower a local ecosystem of future entrepreneurs. The men on the panel spoke about the importance of being “he for she” male allies, agreeing that the more inclusive Sierra Leone becomes, the more the local tech scene will flourish. In the session that followed, mentor Jill Finlayson spoke about how to combine technology with community impact, outlining key elements that make a business successful. She gave the audience 10 reasons why Sierra Leone (commonly referred to as “Salone”) is becoming “Salone Valley,” highlighting local fellows who are solving real challenges, learning from their customers and taking risks. She showed that, through her company Faridah’s Beauty, 2017 fellow Umu Kamara is solving a real-world problem. Salwa Campbell’s company, Fix Solutions, exemplifies listening and learning from your customer base. 2018 fellow Bernadette Kargbo, currently in the beginning stages of starting a business, is showing how making a business plan is essential in starting your own venture. In the breakout sessions that followed, attendees separated into three mentor-led groups, discussing building effective teams, how to develop a business plan and best practices for communication and social media. In their session on team building, Jennifer Gieber and Shalaka Prabhune showed the group how to be a part of a “SMART” team: by being Specific with your intentions, having Measurable and Attainable goals, being Realistic about your capabilities, and ensuring your goals are Time-bound with a deadline in mind. In their group, mentors Katy Dickinson and Katie Penn shared free online resources that can help generate a business plan. They spoke about creating an elevator pitch, reminding the group to keep it short and keep it clean, focusing on your differentiator and what makes your plan unique. That evening, the delegation hosted Pitch Night and Startup Exhibition, providing fellows and mentors an opportunity to support young women and adults in learning the fundamentals of an effective pitch. After a welcome, attendees separated into two groups – one for young women, one for adult women – to learn the key elements of pitch delivery. 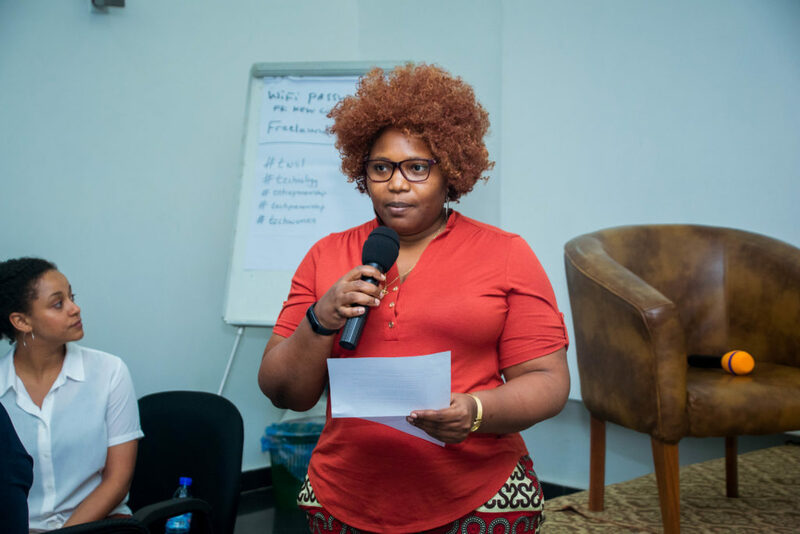 In the young women’s group, 2018 fellow of Zimbabwe Natsai Mutezo led by example, using the same business idea and pitching it two ways: one pitch was dispassionate and generic, leaving the audience unsure of her mission and perspective. The second pitch, however, pulled the audience in to the story; her descriptive words and effective delivery allowed the group to not just invest in her, but also her story. After learning about the core components of a successful pitch – a well-researched topic, an introduction to the problem and a solution that presents a bigger picture – the young women broke into small groups, ready to brainstorm. They were tasked with first identifying a problem in their community and then delivering a one-minute pitch on how they plan to solve it. One group of young women, led by mentors Pamela O’Leary, Jackie Scoggins, Jennifer Gieber and 2017 fellow Haja Sovula, began by discussing everyday issues their communities face. They spoke about the lack clean water, not having dump sites for waste and the prevalence of teen pregnancy in their communities. Through brainstorming, the girls identified a theme: due to unclean water, young women often leave their homes late at night to fetch water, making them more vulnerable to sexual violence and unplanned pregnancies. They discussed that if the community disposed of their waste responsibly, the water would be cleaner and the rate of teen pregnancy would decrease. They began practicing their pitch, with the mentors and fellows guiding them and giving feedback on how to make it more compelling. Armed with their narrative, the girls pitched their proposal which included leveraging local community leaders, educating young people and advocating for the safety of women at night. The two other pitch groups shared similar topics: one pitched on the issue of sexual violence, arguing for a public awareness campaign and education initiative. The other, tackling the issue of clean water, proposed an initiative that would install water pumping machines in local homes. The adult group, led by mentors Kira Gardner, Katy Dickinson and Shawne Van Deusen-Jeffries, addressed a range of issues within the country. One group spoke about a recent flood that triggered a landslide resulting in over 1,000 deaths. Research shows, they said, that flooding is caused by plastic waste. The initiative they pitched began with a pilot community, setting up a system to encourage environmental responsibility and purchase plastic waste. Another group spoke to Sierra Leone’s need for science workers, pitching a STEM after-school program and summer camp that will supplement the current school curriculum and instill a love of science in the next generation. Although pitch winners were chosen at the end of the evening, the event was not about winning; it was about developing entrepreneurial skills, practicing teamwork and showing growing leaders that they have the power and ability to implement change. Each inventive pitch served as a reminder of the progress that can be made when women and and girls have a platform and an opportunity to become leaders in their communities and beyond.